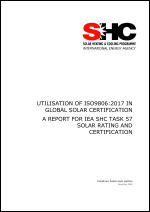 A comprehensive guideline for use of the new solar collector testing standard ISO 9806:2017 has been elaborated. 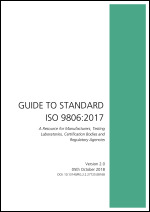 The purpose of this guide is to provide guidance about the application and use of the ISO 9806:2017 standard, concerning the testing of solar thermal collectors. It is intended to support the interpretation and application of the standard. The guide has been developed with three different target groups and objectives in mind. - A guide directed to established and new test laboratories for collector testing. The main purpose here is to give a quick introduction to the standard for new laboratories and in general to contribute to a uniform interpretation of the standard and presentation of results. - A guide directed to manufacturers and importers of collectors. Here, the purpose is to give a very light introduction to the standard and to explain how it is used for type testing as well as for innovation and development support. - A guide directed to certification bodies. The intention here is to provide access to easy evaluation of the presented results. In the Arab countries a certification scheme (SHAMCI) for solar thermal product is being introduced. SHAMCI is very much inspired by the European certification scheme Solar Keymark, and in the task a comparison between SHAMCI and Solar Keymark has been elaborated. 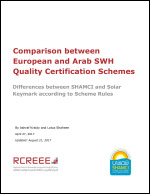 This paper compares between the certification schemes and quality mark of solar water heaters (SWH) in Europe; represented by the Solar Keymark (SK) and the Solar Heating Arab Marks and Certification Initiative (SHAMCI). The paper also discusses the expected benefits of realizing a harmonization between the two previously mentioned schemes, highlighting current and possible future cooperation. To support implementation of certification schemes in countries regions without tradition / experience in certification schemes, an introduction to product certification schemes at a general level has been elaborated. 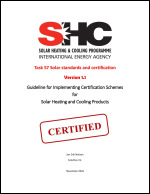 Here guidelines for how to initiate and implement a certification scheme for solar heating and cooling products are given. What is certification: A product certificate (mark/label) is given to show that the product fulfils some specific requirements and/or have some specific characteristics. Product certificates/labels/marks are well known from the market – e.g. the European CE marking and Energy Rating/Labelling from different parts of the world. For some products - e.g. electrical products - focus could be on safety. For other products - e.g. energy using or producing products - focus could be on energy performance. The basis for certification schemes are usually standards giving the specific requirements for the products – and defining the test procedures for how to check if requirements are fulfilled. Update of Task 43 questionnaire with indication of interest in use of international standards. A new questionnaire with indication of interest in use of international standards has been elaborated – and the results analyzed. This survey shows that countries are increasingly adopting ISO 9806, validating the value of the similar study completed in 2014. Further, this study has captured many extra recommended changes which if included in future revisions of ISO 9806, will make it more likely to continue being adopted. This study has found that incorporating the recommended changes from China is the most pressing concern when considering future revisions of ISO 9806. Finally, this study has gathered much valuable information about the systems and markets that exist in each country. ISO 9806 Solar energy - Solar thermal collectors - Test methods, the international standard for testing solar thermal collectors, was first published in 1994. Since that time there have been advances in technology, resulting in a need for the standard to be updated. The most recent update was completed in 2017. The thirtyfour member nations of the European Committee for Standardisation (CEN) have adopted ISO 9806:2017. This study investigates the likelihood that ISO 9806:2017 will be adopted in other countries around the world and follows up on a similar study in 2014 regarding ISO 9806:2013. To determine this, a survey which received 84 responses from 35 countries was conducted. Respondents were asked how likely their countries were to adopt the standard and what, if any changes could be made to the standard to improve it. Sixteen countries outside of the CEN membership were identified as having reasonably large solar market size and were targeted by the 2014 study have again been targeted by this study as well. Responses were received from thirteen of these countries, many of which suggested alterations to ISO 9806 in order to increase the likelihood of adoption in their country and will be used to inform the next revision of ISO 9806.